Offering washroom vending services can be an important addition to the space that can help make that positive impression on guests and customers. We have all been caught short by something and used a vending machine to solve the problem so most people now expect to see certain types of these machines in all public washrooms. TWC Group can install and stock these machines for you with all the essentials that customers are shown to have most often used. We offer vending machines that dispatch anything from sanitary and health products to nappies to ensure your customers’ needs are met. We can service on a schedule that suits your needs. This means that the service is cost effective for your business as well as building goodwill from your customers. 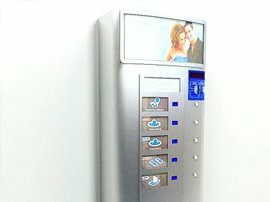 We have a variety of styles of vending machine that can work for differently sized washrooms. These include slim styles that are ideal for smaller spaces and larger models for big washrooms. You can opt for a themed vending machine that offers products around commonly used requirements or multiple vending machine systems that offer several products in one unit to cover the most commonly required items. We can offer branded refills for your machines if you have a particular brand you would like to use as well as providing nappy kits for those parental emergencies that include disposal nappies and wipes. We also offer nappy waste removal as an additional service to help deal with the waste created. Your local washroom vending machine provider. We provide our full range of washroom vending machines across the whole of North Yorkshire, East Yorkshire, West Yorkshire and South Yorkshire, operating out of our locally based depots situated in Hull and Thirsk. Our washroom vending services in North Lincolnshire include our full offering and covers locations such as Scunthorpe, Grimsby, Brigg, Barton-upon-Humber and all the surrounding towns and villages across the Humber region. The washroom vending services detailed are available to customers located in the North East region, including cities such as Middlesbrough, Durham, Sunderland, Newcastle, Gateshead and all of the nearby towns and villages.